Why did the NDP lose? Adrian Dix and the NDP have been defeated in an election that was widely expected to yield a comfortable win for the centre-left party. Over the course of the month-long race, BC politics threw off the political intensity often associated with battles of left and right. Instead of attacking the BC Liberal record, Dix and the NDP chose a strategy of passive precaution, waiting for the other side to falter. Even if the campaign was marked by few highlights, Dix framed his party’s approach in both lofty and strategic terms, arguing that the new BC NDP had risen above partisan bickering and the petty politics of the BC Liberals. Supporters framed this “21st century” approach as a necessary path for winning government. Beneath the media strategy — the story went — a progressive platform was held waiting to be implemented once in power. In reality the NDP allowed itself no alternative platform from which to launch a criticism against the BC Liberal record. On each big issue the NDP chose instead to emulate the BC Liberal platform: rock-bottom corporate taxes, privatized affordable housing, health care austerity and ongoing neoliberal reforms. Instead of fighting on the basis of a progressive policy platform, the NDP message was simple: We can govern; we can oversee the status quo because we are as mature as the common-sense Liberals. NDP’s uninspiring decision to emulate — and indeed flatter — the politics of the ruling party resulted in a record low voter turnout of 48%, down from 58% in 2005. No doubt there will be disagreement in the coming days about the extent to which the NDP, if elected, would have enshrined the historic dismantling of the welfare state, already underway since the 1980s. What is less contested is that fact that neither party in the running was planning to bolster public spending, significantly raise taxes, or reverse the rise of P3s. Is it possible that a do-nothing campaign served to entrench rather than reverse the cynicism of BC voters? People of colour, First Nations communities, people with low-incomes were simply not the focus of the NDP machine, whose overriding aim was to allay the fears of urban property-owners and convince the white middle class that the NDP is no longer a socialist outfit. Given the candidates, too, there is little surprise that the NDP failed to highlight the failure of the BC Liberals. The NDP’s George Chow, for example, was roundly defeated in Vancouver-Langara. As a former Vision councillor in Vancouver, Chow was part of years-long relentless praise heaped on BC Housing and BC Liberal MLA Rich Coleman. The inability for Chow and Mayor Robertson to raise a criticism of BC Liberal housing policy cannot be overlooked as a cause of the NDP defeat. Journalists have long commented on the “tight bond” between city hall and Coleman but the larger significance of political Trasolini-ism has been under-acknowledged. The housing crisis in BC is deeper than it has ever been and people are spending more and more money on ever-deteriorating housing. Yet Vision, Chow and the NDP have insisted on a politics of compromise that makes popular politics almost entirely illegible. Posted in Analysis. Bookmark the permalink. Nate, instead of blaming others, you really need to look inwards. Successful politics means governing from the centre. It also means choosing a leader whose past is not sullied. The NDP went hard left with Dix and paid the price. Finally, until the NDP adopts one person, one vote in its constitution, it will continue to lose elections. This is because public sector unions don’t represent everyone’s ideas. Anti-Developer, I too am anti-developer, but I doubt that Dix became leader because of the public sector unions. I think he became leader because he’s a pit bull. Personally, I would rather have seen Horgan lead the NDP, but no matter which leader, I think the NDP strategists TOTALLY underestimated the effectiveness of Crispy Clark’s school-yard, back-alley attack ads. Elections have become the triumph of the dirtiest. I agree with gpayerle. If the election proved anything, it’s that negative politics win. It is certainly possible to be critical without being nasty or shading the truth (both of which describe some of the Liberal broadsides), but Dix & the NDP strategists didn’t seem to realize even that. The earlier polls showed the NDP in the lead because the Liberals were disliked for all sorts of bad things, and those needed to be emphasized over and over and over. They weren’t. For what it’s worth, I supported John Horgan in the leadership race. Saying that the NDP went “hard left” with Dix is a total joke. Meaning I agree with Kevin. The NDP candidates and their supporters selfishly felt nothing but ENTITLEMENT to governing the province. They were convinced they’d be elected … by default. “It’s our turn, right?” Many must have felt that it is actually possible to get something given to you with doing as little honest work as possible. Clearly, they did not listen to the electorate, and lazily kept reading the media-bashing of a sitting government. Nice people, but a profoundly incompetent group politically. It has been 13 years since the NDP were almost extincted from the political landscape and a decade since Carole James became leader. Since then, the NDP have had the chance to re-invent themselves into a viable 21st century party, as many centre-lefts have done in the western world. They have utterly failed, still stuck in the early 70s. It may well be more than a decade away from their next chance to govern. Or blow it again. Terrible candidate. The Liberals ran on two themes: Glen Clark government was a failure that drove jobs to Alberta; Adrian Dix is a weasel who lied to the cops and pocketed a fat severance. Hello. Was that not predictable? It is also true, as you say, that the NDP did not present an impressive, interesting, distinct set of policies. What a gift to the Liberals, are the NDP braintrust. I wouldn’t let them shine my shoes – they would start using a wrong colour and forget to do the other one. I don’t see how the NDP went “hard left” this time around. If anything, they sat on too many fences (and pipelines) for too long. why NDP was defeated in BC when it was ahead of the game more than 20% according to all the polls. I think the answer is participation. NDP did not have any agenda that excite people to come and vote. Majority of people did not vote since they did not see any differences between NDP and Liberals. They did not want to bring Adrian Dix to power so he can make a big Resume and get a job with Jim Pattison corporation later. When the Capitalist system is in crisis, people either turn to right or left not to center. Centrist policy does not have any room during the crisis. NDP watered all its policies down to make itself centrist so it can get into power but it loses the interest of people to come out and vote. I hope the activists think about this. The Capitalist crisis gets deeper all around the world including Canada. Contrary to the popular belief, there will not be a real recovery for this crisis. we are not living in 80’s or 90’s. The capitalist system is facing one of its major crisis and it can only come out by reducing the standards of living for millions of people in North America and Europe and the rest of the world. we need a real alternative left with leftist policy to fight back. We need to turn around and get the power to the hands of 99%. The 1% will not give up their privileges very easily. No simple answer here – but the simple answer seems to be that the ‘NDP’ wouldn’t have won even if they had won. The people that own this province will not allow it and never have allowed it. The business elite has it’s long fingers deeply embedded in every level of social organization in this province – including, of course, the NDP. It plays both sides of the NDP. They support it and destroy it at the same time. The media treatment of the party is instructive. The NDP always gets airtime – enough for people to know it is there and that there is a kind of social/environmental/caring ‘alternative’ floating around – they’ll even write editorials saying it is time to vote for the NDP (if the Liberals (formerly known as Social Credit) get too unpopular) – but when there is the possibility that things might get out of hand (i.e. after the party actually has been elected – or, god forbid, they get even marginally uppity about things like pipelines) they pounce like hyenas on wounded prey and mobilize people against them. In an environment like this the NDP is more of a hopeless mirage than a reality. The party is a carrot dangled in front of us – and a prod used to frighten us – and meanwhile (incredibly) Elmer Fudd is in control – selling us the illusion that we’re Bugs Bunny. The NDP is a poem of social control. We need to write some new poetry. Nathan hits the nail on the head. It’s not a right-left issue so much as policy-definition and an “are they listening” issue. Did anyone in the election genuinely listen to the public, provide full disclosure of anything, debate evidence-based policy, and give any indication that any voter/taxpayer/service recipients actually mattered? Where were the principled and evidence-based policies on salmon farming (ban it), hydro-fracking (disclose or stop), tar and coal transport (not), hydro power development (or none! ), energy conservation, public housing, harm reduction and treatment, seniors’ housing, healthcare quality assurance and cost containment, education policy (class size! ), fair wages, foreign direct investment (including into real estate! ), etc? Where was the substance, and how did either party engage actual voters in the discussion of THEIR and their children’s futures? I am looking for confirmation of the exact voter turnout, but if it really were 48% as reported early in the press, then it was the lowest in at least the past 40 years in any Canadian provincial election. Some provinces turn out consistently over 75%. Is democracy in BC dead, or better put, how can we save it? What did we do wrong to blow an election that was a slam dunk? If and when you can actually do this, then rebuild your party to a place where it can WIN ELECTIONS. I don’t see it happening, though. The NDP seems to enjoy losing. It’s a classic case of incestuous amplification. Simple answer: They thought the election was a slam dunk. The New Democrats in BC have a historic, natural position as a secondary, protest-vote, opposition party. And there are strong, internal party forces to keep it that way. Other political parties throughout the western world have evolved to thrive. Federally we had PC, Reform, Alliance, Conservatives. Provincially, there was Social Credit, Liberal, and soon, a new branding. These are fast, effective evolutions. But the NDP have refused to re-invent. They have been calling themselves “New” for over half a century. New Dinosaur. But, change has a cost. 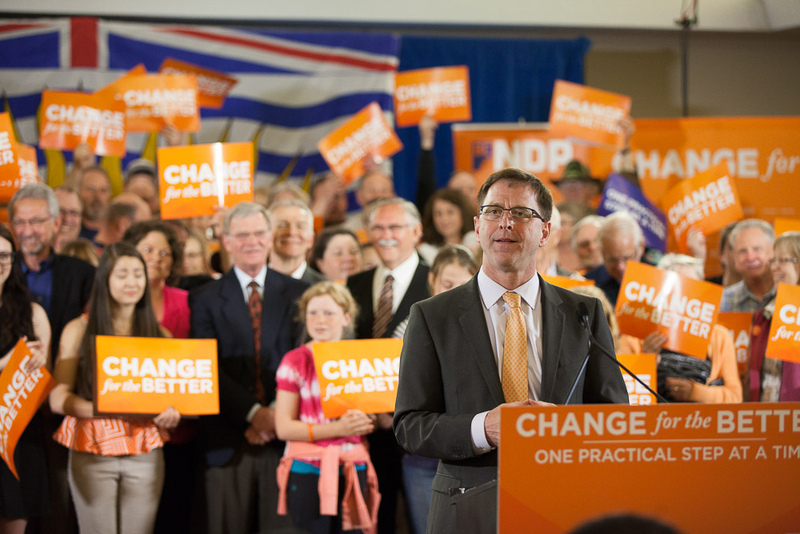 In BC, in 1972, the NDP got in for 36 months during a changeover from Bennett father to son. In 1991, the NDP got in again, when Vander Zalm’s Social Credit morphed into the new Liberals under Gordon Wilson, then further with Gordon Campbell. After ruling for 10 years in the 90s, the NDP utterly failed in consolidating power, and were nearly extincted by BC citizens in 2001. That was their once in a century opportunity to evolve, but, they just redecorated themselves with early 70s. Bizarre. The internal force is that there no incentive for existing NDP MLAs to change. Once elected in opposition, they get gifted by their supporters the highest paying (and pensioning) jobs they’ll ever have, and they won’t let go. They have the easiest jobs in the legislature because they don’t have the pressures and publicity of governing. So, despite claiming to be modern and progressive, they refuse to go through a few years of losses to create a viable, ruling party in BC, and remain perpetually peripheral. Some think that the only reason the NDP exist is to be a warehouse for the substantial amount of hate, bitterness and envy many people carry around with them. This is the best analysis of the the New Dinosaur Party I have ever read. Alas, it will be totally lost on the Faithful.